I considered putting on crazy medieval tights but forewent that option to show this look that has nothing to do with the poem, a cute little pinky purple ensemble. My top is an inexpensive find from Miffyhoi Rosca, who offered this as part of an outfit at the TFG Discount Shop. I really dig the asymmetrical shape. The theme of this visual poem, however, is the shape and skin. 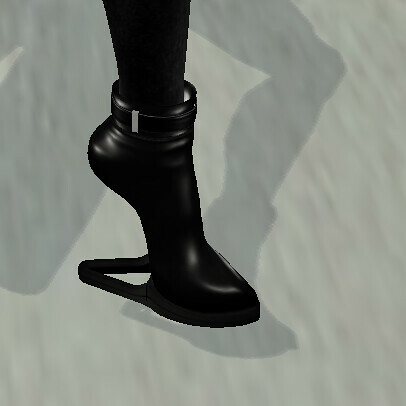 I am wearing a shape from Freedom Parx, part of a new series she is selling that looks to break the old clichés of SL. She doesn’t aim for “beautiful” as much as interesting, though I find this shape pretty cute. I will remark that I did tweak the mouth corners a bit—Freedom shows the shape with a frowny face, which is something I really dislike. It’s great because the shapes are offered mod—that’s the only mod I wanted to make to this shape. Lion Jonesford has recently come out with a new line of skins and they overlay this shape perfectly, especially in light of their Asian flavor. She offers them in a series of more pastel make-up tones for the most part, which I find lovely. The pinks and purples offset the pale complexion (which is a great color) perfectly. She also has a series of more radical make-ups (would you expect any less from Lion?). She is preternaturally silent, her coat swirling around her as she moves, unusually graceful in her strange platform boots. All I can feel is the susurrus of air as she circles around me, her eyes focused on me from behind the mask of her facial tattoo—wings as if from a phoenix, burning around her eyes. I can’t imagine the pain of receiving that tattoo. I wonder why she chose to get it (or didn’t choose), what brought her to this point. Last week I was making sweet little girl outfits; this week I seem to have found my inner demon. I start with an ensemble from Bare Roses, which is the source for a whole range of inexpensive and imaginative outfits. This particular outfit comes with the usual overabundance of sculpties and dead-on details, including leg buckles and arm buckles. I was inspired by this skin from Plastik, which is a hunt item for the Style of the 50s hunt. (Don’t ask me more about the hunt—I tripped upon it and took advantage so I could see what the big kerfluffle about Plastik skins is.) I was able to work this whole look around the skin and makeup from that set, which I like a lot for its fantasy flavor. My boots are ankle versions of Ono Zinner’s awesome fantasy boots (which I now see don’t show in profile so you get a bonus photo). A little green is finally showing up outside. I am thrilled—it’s my favorite color. That is why I was thrilled to get this darling green dress from LeeZu Baxter. It’s expertly drawn and sculpted with a flirty little sculpty skirt. I discovered I only wear the A/B cup accoutrements—the ribbon and bust. I love how she made the sculpted pieces and made them work for this little dress. LeeZu attends to all the details too, including the zipper up the back and the translucency of the ribbon. My hair is a new one from Truth Hawks—another home run. I recently visited Mocksoup Graves’ store because I love her make-ups. They are a great overlay on many skins because they are pretty sheer and seem to fit many lip sizes. I overlaid it on Tuli Asturias’ beautiful Sara skin that also comes with great lipsticks, but I really liked this copper color from Mocksoup. Purple is the color of royalty. That’s what makes it classy and remarkable. I put together these great separates to make a purple outfit for a lady of sophistication. First start with this top from Carrie Snowpaw. Carrie has ingeniously made a blouse with a blouse-on sculpty prim addition that makes the blouse look like it’s blousing out at the bust while tight around the waist. She also made some pretty prim buttons and I love the frilled cuffs. My skirt is a versatile piece from Chrystina Noel. With its sculpty skirt and cute tweed texture, it’s a great skirt for many outfits. I have a pretty skin with purple makeup from Alexandra Barcelos and I couldn’t resist wearing eggplant eyes from Ikon Innovia. My earrings were a special pair Abraxxa Anatine made for RFL. And check out the pumps from Pixieplumb Flanagan—inexpensive and chic! Easter is when you put on your prettiest frock and enjoy the spring. Tammany Goodliffe has just come out with a series of pastel perfect pretties for spring, all ideal for an Easter gathering or tea party. Notice the beautiful rendering of the top over the lovely skirt (which floats like a dream). Not a seam shows, all the edges are perfectly clean and the color is gorgeous. The truly winning part of this ensemble are the roses, available for either shoulder or your hair. Look closely and you will see how exquisitely Tammany rendered these roses, from the leaves to the petals. I am showing it with a simply lovely new hair from Truth Hawks. When my hair was a bit longer (and I was a bit younger), I often wore my hair this way. My shoes are a classic from Fallingwater Cellardoor—ladylike and pretty and beautifully textured. And I defaulted to Nena Janus’ skin, which has the springtime glow I wanted. They called her Aluminum because, even though she was fluid like quicksilver, she was light and plastic, silver and shining and electric. LeeZu Baxter’s newest is another in her line of more interesting experiments in sensual and sexual design. This piece reveals the middle body pretty substantially (and this is kind of almost a family blog) so I wear a lacy bodysuit piece from Jojorunoo Runo. This stunning skin with its shimmering quality is a new one from aida Ewing, available at The Dressing Room. This is a perfect face for Aluminum. And the wild hair is an older piece from Mirja Mills, but still wonderful, especially for this look. Soft, durable, malleable and resistant to corrosion. It’s not quite shorts weather. In fact, it’s still abysmally cold outside. I have been going through my plant catalogs without a lot of enthusiasm this year because spring has been slow in coming this year. So what am I thinking wearing shorts? Lynaja Bade has the answer with this darling outfit—wear tights with the shorts! This serves two purposes actually—warms the legs and saves your knees from the dirt when you are kneeling down poking at your irises and carefully teasing out the old plants from last year from the tender new shoots. I love the textures in the outfit–the old-fashioned print on the blouse, the wooly tights. This outfit is dirt cheap (no pun intended) at her store right now with several other great things on sale as well. I am wearing one of Sophia Rossen’s new shapes. I realize she includes a styling card with each shape, and my choice of skin is not the one she chose. (In fact, she gives you a whole set of information–where to get skin, eyes, and hair.) Nevertheless, it’s a fine shape with a lovely face and works well with Tuli Asturias’ newest skin, which is another home run. Is it a terrific shape or a great skin that makes me look good here? I don’t know, and does it matter because I look cute.